at the very young age of 18 years & the location of grave remains unknown till date ! Birth : In Makkah Friday 20th of Jamadi-ul-Akhar the fifth year of Besat when Quraish were busy in constructing the building of Khana-e-Kaabah. 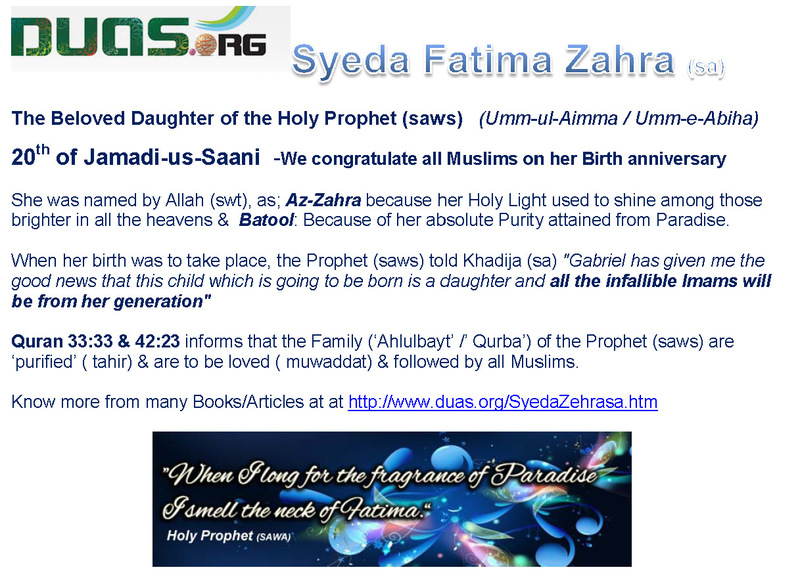 When Hazrat Fatima's (S.A.) birth was to take place, the Prophet (P.B.U.H.) told Khatija (S.A.) "Jabriel has given me the good news that this child which is going to be born is a daughter and all the infallible Imams will be from her generation"
Fatima (S.A.) was brought up and trained in the family of Prophet (P.B.U.H) and took advantage and share of the knowledge and wisdom of the Prophet (P.B.U.H) She heard the recitation of Quran from the Prophet (P.B.U.H.) and leant it by heart, and got busy with the idea and concept of self training and becoming a complete and real human. She extremely loved her honorable father and the Holy Quran. She took advantage and portion from the blessings of her father's existence. These were the perfections due to which the Prophet (P.B.U.H.) loved her to the extreme. Once his wife Ayesha (R.A.) asked him, "Do you love Fatima Zahra so much, that when she arrives you get up from your place to give respect to her and kiss her hands and make her sit next to yourself?" He replied, "Oh Ayesha! If you come to know why I love Fatima so much, you shall also love her." He considered her the part and parcel of his life, and used to say repeatedly, "Fatima (S.A.) is a piece of me, whosoever tortures her he has tortured me, and whoever pleases her has pleased me." One day, the Prophet (P.B.U.H.) of Islam said, "Oh Fatima God gets pleased on your being pleased and gets furious due to your unhappiness and displeasure"
Fatima Zahra (S.A.), most of all resembled her father in her looks, character, behavior and conduct. Ome Salma the wife of the Prophet (P.B.U.H.) said, "Fatima Zahra resembled the Prophet (P.B.U.H.) most of all the people." The love between the father and daughter was not a one-way process; instead, Fatima (S.A.) too immensely loved her father (Prophet) like he loved her. When Hazrat Khadija (S.A.) died, she was not more than six years of age. After the death of her mother, She always looked after the comfort of her father at home. Fatima (S.A.) was such a daughter who constantly and stably followed the footsteps of her father. The streets and Masjid-e-Haram of Mecca were full of those who teased, insulted and tortured the Prophet (P.B.U.H.). Whenever her respect worthy father returned home in the injured condition, she would wash the blood off his sacred face and dress his wounds and encouraged him with her sweet conversation. Then it was only and only Fatima (S.A.) who pleased and consoled the heart of her father with her sincere love and affection. She by accepting the Prophecy of her father strengthened his hopes. That is the reason why the Prophet used to say, "May your father sacrifice his life upon you" or that he would call her the "mother of her father". Because, she was like a mother for her father. Like her Holy Infallible Father(pbuh), she possessed all the intellectual abilities and achievements. Many verses of The Holy Koran were revealed in her praise and about her spiritual credits. The Holy Prophet of Islam(pbuh&hf) had given her several honorable titles among which one is: The Holy Prophet her Father (pbuh) loved her very much Whenever she would go to the house of her father The Holy Prophet(pbuh&hf) would stand up out of respect to her. Whenever he greeted her, and he would honour her by giving her a special place to seat herself in his house. Very often Her Father(pbuh&hf) would softly kiss her hands and say, "Allah, The Most High; is pleased when Fatimah(a.s.) is pleased. He is angered; whenever Fatimah is angered!" When she attained the age of puberty, it became necessary for her to marry. But she needed a person who must be her match. So that he would appreciate her status and perfection and maturity of virtues and he would know what was the real value and virtue of a human being. This is the very aim of Islam, which as a result strengthens the marital relations. When she became marriage bound many men including Abu Bakar and Umar sent their messages for asking her hand in marriage. But the Prophet (P.B.U.H.) said, "I am waiting for the revelation in this connection." The revelation came and Fatima's husband was also nominated. God ordered the Prophet (P.B.U.H. ), "Oh my prophet get the light (Noor) married to the light i.e., get Fatima (S.A.) married with Ali (A.S.)." When Ali (A.S.) approached the Prophet (P.B.U.H.) to request the hand of Fatima (S.A.) in marriage, although he had nothing with him from the wealth of the world, yet he possessed a gem, which was the reflection of every thing including piety and human nobility. The Prophet (P.B.U.H.) having acceded to his request entered the house to ask Fatima (S.A.) her opinion about it. He said to her "Oh daughter you know fully well that Ali (A.S.) is the one who was the first ever faithful out of the lot. I had prayed to God, to give the best husband for you. Therefore, God has selected Ali (A.S.) for your husband, so what is your opinion?" Fatima (S.A.) remained silent. The father took her silence as the token of her being agreed and got her married with him. After the aggregation of the tribe of Bani Hashim and the friends and relations by the order of Prophet (P.B.U.H.) took place, he (P.B.U.H.) delivered a Khutba (religious speech), sermon, and got Fatima (S.A.) married to Ali (A.S.) over a dowry equivalent to four hundred Masqal Silver (one Masqal comes to nearly 3.45 grams). A companion (Sahabi) stated, "The Prophet (P.B.U.H.) got a sheep slaughtered and invited a few persons and made them witnesses upon the marriage. After one month of the marriage in the 2nd Hijra on the night of "zaffaf" (marriage night) the Prophet (P.B.U.H.) held Fatima (S.A.) by her hand and handing her hand over to Ali (A.S.) said, "Oh Ali, Fatima is the best wife for you." There after, he addressed Fatima and said "Oh Fatima, Ali is a good husband for you." Then he said. "Now, both of you move towards your real home." The women of Bani Hashim, Ansar and Muhajireen, after taking their dinner, rode Fatima (S.A.) on the camel of the Prophet (P.B.U.H.) and took her along to Ali's (A.S.) house with great fervor. Ali and Fatima started living near Quba mosque at a distance of eight kilometers from Medina where the Prophet (P.B.U.H.) had stayed on migration from Mecca and had waited a week for Ali (A.S.) to join him. After some time Ali (A.S.) came to the city and selected a house adjacent to the house of the Prophet (P.B.U.H.). Because the Prophet (P.B.U.H.) could not tolerate the separation of Ali and Fatima, since, it was a great shock for him. The house of Ali (A.S.) which was made of mud and date timber was exactly opposite to the window of the Prophet's (P.B.U.H.) house so that he could daily see them. This was the same house of Ah-le-bait of Purity and piety, which was praised by the Holy Quran and was away from all kinds of impurity (sins). The house wherein Ali (A.S.) was the father, Fatima Zahra (S.A.) the mother and Zainub, Kulsoom, Hassan and Hussain (A.S.) were the children. This home is a memorial one for all the races of every age. Fatima Zahra (S.A.) had grown up along with Ali (A.S.) and considered Ali (A.S.) as best husband and the lover and devotee of his father. The fate's hand had joined these two blessed persons in such a special way, which did not have any example in that period of darkness and ignorance. Fatima (S.A.) knew that although Ali (A.S.) does not possess any thing from the wealth of the world but he has the great treasure of self sacrifice and devotedness of which he had given proof to fulfill the aspirations of her father (P.B.U.H.). She was aware that all the youth period of her husband was spent defending Islam and in Jehad. He did not think anything except the service to Islam and it's welfare. Fatima (S.A.) never thought that since she was the daughter of a Prophet (P.B.U.H.) and leader therefore, she must have maidservants at her home. Nay, instead she performed all the domestic works with her own hands for instance grinding the wheat with millstone, baking bread, looking after the children etc. But, she, leaving aside everything would only think about God. She was always in search of a life giving and radiant education. Fatima (S.A.) was such a tree, which must only breed and grow in the shade of revelation and bring the fruits of freedom and justice in its deep shadow. This is the very root and origin of the tree of purity. The lives of Ali (A.S.) and Fatima (S.A.) are a school of thought for the next generations so that the people may learn a lesson from them. They had such coordination that when Ali (A.S.) got free from the work outside the house, he used to lend a helping hand to Fatima (S.A.). On the other hand, the daughter of the Prophet (P.B.U.H.) also, always tried to keep Abul Hassan (Ali) (A.S.) happy. Both led such a life full of love and affection that they never called each other by their names, rather, whenever Ali (A.S.) called her he addressed her by "Daughter of the Prophet (P.B.U.H.)" and Fatima (S.A.) would address him as "Ameer ul Momineen" (the Chief of the Faithfuls). They never neglected the training of their children. They always gave their response with love and affection. They loved their children too much, so far so, that they never got angry with them & rebuke them and never said anything to them, which may annoy or case their sorrow. In the 3rd year of Hijrah the first son was born to Fatima (S.A.), who was named "Hasan (A.S.)." The birth of this child saved the Prophet (P.B.U.H.) from the torture of the enemies and the sorrow of the separation of friends. He (P.B.U.H.) happily and joyfully visited Fatima's (S.A.) house and took Imam Hassan (A.S.) into his lap and recited Azan and Aqamat in his ears. Then he gave some silver, which was equal in weight of the hair of the child, as alms. One year after the birth of Imam Hassan (A.S.), Imam Hussain (A.S.) was born. Now the Prophet (P.B.U.H.) got the substitutes for his sons Qasim and Tahir who had died in the childhood, so that God had decided that the race of the Prophet (P.B.U.H. ), persists and survives through her daughter. The dawn of these two stars brought a new horizon in existence wherein the Prophet (P.B.U.H.). Ali (A.S.) and Fatima (S.A.) saw themselves. The Prophet (P.B.U.H.) thanking God and considering those two children as the substitute of his sons, loved them very much that the world was astonished. One day, when he (P.B.U.H.) visited Fatima's (S.A.) house he (P.B.U.H.) saw that Ali (A.S.) and Fatima (S.A.) were sleeping and Imam Hassan (A.S.) was weeping due to hunger. The Prophet (P.B.U.H.) slowly picked up the pot, milked the goat, and fed the child who then became silent. Once, he (P.B.U.H.) was passing by the house of Fatima (S.A.) when suddenly he (P.B.U.H.) heard Imam Hussain (A.S.) crying. He came back to her home and said, "Oh Fatima! Don't you know that I get upset by the weeping of this child?" One year after the birth of Imam Hussain (A.S.), a female baby was born, who was named "Zainub" and even after another year another female baby, who was named "Ome Kulsum." "Zainub" and "Kulsum" were the names of the daughter's of Prophet (P.B.U.H.) who died before 8th Hijra. In the 8th year of Hijra a son named Ibrahim was born to the Prophet (P.B.U.H. ), who died after one year of his birth. Now, the Prophet (P.B.U.H.) was only left over with Fatima (S.A.) and her children. He (P.B.U.H.) loved his grandchildren to such an extent that he (P.B.U.H.) never tolerated to get separated from them. Whenever he (P.B.U.H.) went out of the house, he (P.B.U.H.) would always carry one of them on his shoulders. No one has the right in Islam to burry a dead body in the mosque. Masjid-e-Haram is the most superior of all the mosques, being the Qibla of all the mosques of the world. A lady named Hajir is burned there. God has ordered all the human being to visit Mecca and perform the circumambulation of her grave. But Fatima's (S.A.) status is much sublime and higher than the lady who has been laid to rest in Kaabah. Fatima (S.A.) is one of the four superior most and virtuous ladies i.e., Mariam, Asiyah, Khatija, Fatima. Which Fatima (S.A.)? Fatima (S.A.) is the heir of all the honors and virtues. Who is the one continuing the great race originating and beginning with Adam (A.S.), Ibrahim (A.S.), Moosa (A.S.), Essa [Christ] (A.S.) and reaching Mohammad (P.B.U.H.). The Prophet (P.B.U.H.) was on the bed of ailment and illness. His head was in the lap of Ali (A.S.) and Fatima (S.A.) was weeping holding the hand of her father. Suddenly, the Prophet (P.B.U.H.) opened his eyes and when he saw her weeping. He (P.B.U.H.) said, "Oh daughter! Recite the holy Quran for me." 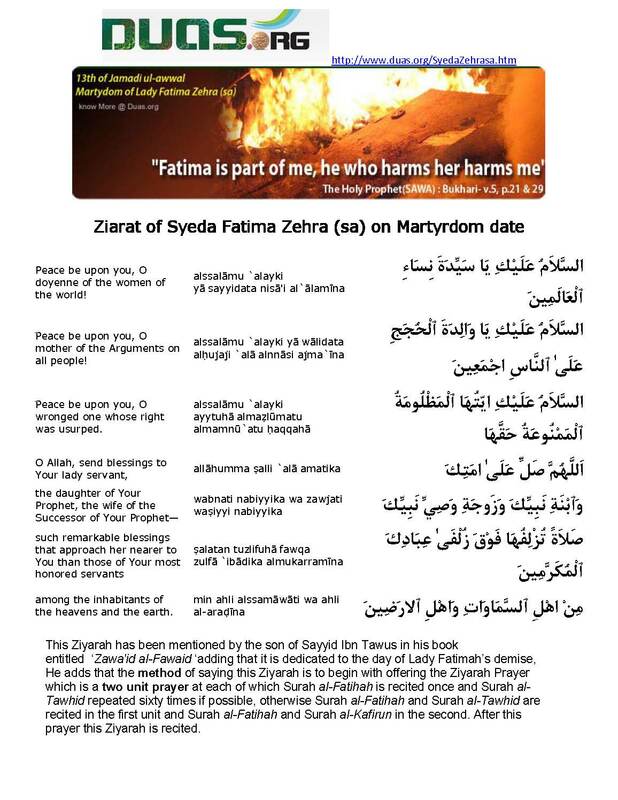 Fatima (S.A.) recited a few verses from the holy Quran. The Prophet (P.B.U.H.) by getting her dear daughter recite the verses meant to listen her voice in the last moments of his life. No sooner, the Prophet (P.B.U.H.) passed away the house turned into a mourning house. The delicate heart of Fatima (S.A.) took a deep effect by her father's death. Only a few hours later, another big grief took shape i.e., the right of her husband was extorted and usurped. Fatima (S.A.), with the help of a few faithful companions of his father, defended the right of her husband strongly. So far so, that one day she went to the Prophet's mosque along with the women of Bani Hashim and Ansar and by delivering a speech described her object and point of view. So that, all the audience started weeping. But there was no body to give a positive response to the voice of Fatima (S.A.). They were no longer true and faithful. Their faces were covered with the dust of abjectness, misery and misfortune. She returned to her house with a heave and grieved heart and said to Ali (A.S.), "Oh Abul Hassan why have you sit down with your hands upon each other like weak, feeble, powerless and unable men and why don't you defend your right?" Ali (A.S.) said, "Oh the daughter of Prophet (P.B.U.H.) Do you not want that your father's name be pronounced in the mosque? Don't you have the desire that the cause and mission of your father remains alive? Fatima (S.A.) said, "Why not?" Then he said, "If I draw the sword today (as the enemy wishes) the efforts of your father will be finished and we will become unsuccessful. On hearing this, Fatima (S.A.) got silent and thereafter, she did not utter any word. She started her silent war in the same manner as her husband Ali (A.S.) spent twenty-five years in a great-oppressed state. Fatima (S.A.) was sure that none of her plans can mature in connection with Ali (A.S.). Therefore, she did every thing possible so that a wrong foundation for the caliphate is not laid. But evidently and obviously she could not succeed in her efforts and was compelled to face hopelessness and dismay. After that, it became hard for her to live and she became fed up with the world and day by day got keen and restless for her death. Till at last, on Monday the 3rd of Jamadi ussani, 11th of Hijra, She bade fare well to her children and husband and passed away. She died in the same year as her father had died. At the time of her sorrowful demise Imam Hassan (A.S.) was 7 years of age, Imam Hussain (A.S.) was 6 years, Zainub (S.A.) was 5 years and Ome Kulsum (S.A.) was 3 years of age. God knows, how shocking and painful was the separation of Fatima (S.A.) for her children and husband. When her death time came near she asked the maidservant to bring her water for taking a bath and putting on new clothes. Because, the time for her to meet her father was at hand. The maidservant brought her the water and she put on new clothes after taking a bath and laid down upon the bed facing Kaabah. After a short while, her eyes closed down and lips became silent and motionless and she proceeded towards the paradise. "Innalil laha ina ilayha rajaoon". Imam Ali (A.S.), as per her last will, bathed her and gave her the coffin and buried her in the darkness of the night. Her grave was kept secret and still it is not known and is hidden. So nobody could know where she was buried. Because, the political figures of that period were bent upon opening her grave apart and offer the death prayers again. A negative combat about her grave is going on from that time to the day and from now onwards for the future days to come. The testament and will of Fatima (S.A.) made is clear and evident for the races of those days and all the races to come that the daughter of the Prophet (P.B.U.H.) was subjected to oppression. Fatima (S.A.) remained unhappy and annoyed with those oppressors up to her death. Therefore, those should remain ready for vengeance and revenge. After Fatima (S.A.) passed away Ali (A.S.) and the children became secluded and lonely. Ali (A.S.) sat by her grave and repeated a few sentences in a low voice and then facing the grave of the Prophet (P.B.U.H.) he said, "Oh Prophet (P.B.U.H.) of God! I am returning to you that one which you had entrusted me. O Lord! Ask Fatima what happened with us. She will tell you all about it." Fatima(s.a.) The Radiant Imam Hasan Askari(a.s.) reported that his father quoted Jabir Ibn Abdullah as saying : ' The Messenger of Allah, Peace be Upon him and his cleansed progeny, said : ' When Allah created Adam and Eve, they strutted through paradise and said : ' Who are better than we ? ' At that moment they noticed an image of a girl like they had never seen before; from this girl came an illuminating light so bright that it almost blinded the eyes. He replied : ' Indeed, by Allah if you knew the extent of my love for her, your love would increase for her. When I was in the forth heaven ... that I found these dates softer than butter, more pleasant than musk and sweeter than honey. So when I descended to earth, I came unto Khadija and she bore Fatima. Thus Fatima is a human huri, whenever I long for paradise I smell her. The Fatimah Al-Zahra(s.a.) Pleads Her Case After all else failing, the holy Lady Fatimah Al-Zahra(s.a.), in her desperation and frustration, causes a great controversy among all the Muslims. By personally going to her Father's Mosque of Al-Madinah, after prayers had ended, to publicly expose and demand the immediate return of her rightful inheritance from Caliph and his supporters, who had ordered it confiscated. The Fatimah Al-Zahra(s.a.) had now exhausted all possible avenues in her pursuit to reclaim her rightful inheritance to the Fadak, given to her by her Father The Holy Prophet Mohammad Al-Mustafa( pbuh&hf). But sadly her pleas fell on deaf ears. For this reason, and on the grounds of proving that she has been oppressed by those who professed righteousness under false pretences of faith and piety. At a very last resort the holy Lady Fatimah Al-Zahra(s.a.), daringly went to her Father's Mosque, to face her adversaries and delivered to them the most eloquent of words in her defense, which left the assembly speechless. She chose to proceed to the Mosque at a time when it was crammed with people, in order that her words reached the ears of all the people, who were somewhat accessories after the fact due to their silent approval of the events that occurred after the Holy Prophet's demise. She addressed the assembly in a speech that was both harmonious and systematic. It was an impeccable speech in that it contained no minced words, and was free of equivocation, distortion and slander. Lady Fatimah Al-Zahra(s.a.) used the occasion to firstly acquaint the people with Allah, The Most Exalted, and to disclose the merits of the Islamic religion and to clarify the cause and effect of the Islamic Laws. With this introduction she succeeded in securing the full attention of the assembly and created an appropriate atmosphere in which she could deliver her final statement which contained the underlying intentions and reasons that forced her to leave her house and proceed to the Mosque. And the reasons which warranted her leaving her house were, of course, the misappropriation by the so-called then self appointed caliph Abu Bakr of: The Fadak which was legally hers. One of the most incontrovertible proofs of Fatimah's sinlessness is Allah's saying: Surely Allah wishes to keep away all abomination from you, O People of the House, and purify you with a great purification [our. 33 : 33 ] . The argument in favour of this, is that the Muslim community has unanimously agreed that the `People of the House' (i.e., Ahlu'l-Bayt), intended in this verse are the People of the Household of the Messenger of Allah. Traditions (ahadith) of both the Shi`i and Sunni communities have asserted that this verse particularly refers to 'Ali(a.s.), Fatimah(a.s.), Hasan(a.s.) and Husayn(a.s.) The Holy Prophet(pbuh&hf), moreover, spread over them all one day a Khaybarite mantle and prayed: "O Allah, these are the People of my Household, keep away all abomination from them and purify them with a great purification!" Umm Salamah said: "I too, O Apostle of Allah, am of the People of your House!" He answered: "Your lot shall be good!" The Divine Will expressed in this verse must by necessity be either an abstract will not implemented by an action, or a will accompanied by an action. The first option is untenable because it implies no particular applicability to the People of the Prophet's House; such a will is shared by all obligated (mukallafin) human beings. Nor is abstract will by itself cause for praise. The entire community has concurred on the view that this verse proclaims the excellence of the People of the Prophet's House over all others, and that the verse refers to them alone. Thus the second option (that the Divine Will referred to in the verse is a will accompanied by action) is true, and in it is clear proof of the sinlessness of those who were intended in the verse. It implies further that it is impossible for them to commit any evil action. Moreover, any others whom we have not named here are no doubt not held by general consensus as possessing `ismah (protection from error). Thus since the verse necessarily implies sinlessness it must apply to them (the People of the Prophet's House), because it pertains to no other individuals. The Holy Prophet of Islam(pbuh&hf) said:"Fatimah(a.s.) is part of me"
Another proof of Fatimah's sinlessness is the Holy Prophet's saying concerning her: "Fatimah(s.a.) is part of me. Whatever causes her hurt, hurts me." He also said: "Whoever hurts Fatimah(s.a.), hurts me, and whoever hurts me, hurts Allah(swt), exalted be His Majesty! " The Holy Prophet(pbuh&hf) said further: "Allah(swt) becomes wrathful for Fatimah's anger, and is pleased at her pleasure.". Among the signs indicating Fatimah's exalted status with Allah is an incident related by both Shi'i and Sunni traditionists on the authority of Maymunah (the Holy Prophet's wife), who reported that Fatimah(a.s.) was found asleep one day, the handmill beside her turning of its own accord. She informed the Apostle of Allah of this, and he said: "Allah knew the weak condition of His handmaid; He thus inspired the handmill to turn by itself, and so it did." Among the reports asserting her excellence and high distinction over all other women is the tradition reported on the authority of `A'ishah who said: "I never saw a man more beloved of the Apostle of Allah than `Ali(a.s.), or a woman more dear to him than Fatimah(a.s.)." Traditionists further report on the authority of `A'ishah that: "Whenever Fatimah(a.s.) came to the Messenger of Allah, he would rise from his seat, kiss her on the forehead, and make her sit with him." Traditionists have also reported on the authority of 'Ali ibn Ibrahim al-Qommi in his commentary of the Holy Qur'an, as related on the authority of the sixth Imam as-Sadiq, Ja'far ibn Muhammad(a.s.), who said: "We were told that our forefathers said that the Messenger of Allah often indulged in kissing Fatimah(a.s.) the mistress of the women of the world, so that `A'ishah finally protested saying, `O Messenger of Allah, I see you indulge so often in kissing Fatimah(a.s.) He answered, `Yes, O `A'ishah, when I was taken up to heaven, Gabriel took me into Paradise and brought me near the tree of Tuba (beatitude). He gave me an apple of its fruits which I ate. Thus when I returned to earth, Khadijah, conceived Fatimah(a.s.). Whenever, therefore, I yearn for Paradise, I kiss her , for I find in her the fragrance of Paradise. I also sense in her the fragrance of the tree of Tuba. Fatimah(a.s.) is thus a celestial human being.' "
The traditions which our Companions (that is, Shi'i hadith transmitters), may Allah be pleased with them, have reported in proof of Fatimah's special place - her honoured status and distinction over all the women of humankind - are beyond number. We shall, therefore, limit ourselves to the reports which we have already mentioned. Among the things which Allah completed the great honour of the Commander of the Faithful Imam Ali(a.s.)in this world and the world to come was His special favour towards him in having him unite in marriage with the noble daughter of the Messenger of Allah, who was the most beloved of all creatures to him, the consolation of his eyes and leader of the women of the world. Among the many ahadith (traditions) concerning this event is the sound hadith reported on the authority of Anas ibn Malik, who said: "As the Apostle of Allah(pbuh&hf) was sitting one day, 'Ali(a.s.) came to see him. He addressed him saying, `O 'Ali(a.s.), what brings you here?' `I came only to greet you with the salutation of peace', `Ali(a.s.) replied. The Holy Prophet(pbuh&hf) declared: `Here comes Gabriel to tell me that Allah has willed to unite you in marriage with Fatimah(a.s.). He has, moreover, called as witnesses to her marriage a thousand angels. Allah has revealed to the tree of Tuba, "Scatter your pearls and rubies! " Black-eyed houris rushed to pick the precious stones up, which they shall exchange as presents among them till the Day of Resurrection.' "
It is related on the authority of Ibn `Abbas, who said: "On the night when Fatimah(a.s.) was married to 'Ali(a.s.), the Messenger of Allah(pbuh&hf) stood before her. Gabriel stood at her right hand and Michael at her left. Seventy thousand angels stood behind her, praising and sanctifying Allah. The Commander of the Faithful prided himself on his marriage to her on numerous occasions." Abu Ishaq ath-Thaqafi reported on the authority of Hakim ibn Jubayr, who reported from al-Hajari who related from his uncle who said: "I heard `Ali(a.s.) say one day, `I shall utter words which no other man would utter but that he would be a liar. I am `Abdullah (Allah's servant), and the brother of the Apostle of Allah. I am the one whose guardian is the Prophet of mercy, for I have married the mistress of all the women of the community. I am the best of the vicegerents.' " Numerous reports expressing similar ideas have been transmitted. Ath -Thaqafi reported on the authority of Buraydah, who said: "On the nuptial night of `Ali(a.s.) and Fatimah(a.s.), the Holy Prophet(pbuh&hf) said to 'Ali(a.s.), `Do not do anything until you see me.' He then brought water - or the traditionist reported that he called for water - which he used to perform his ablutions for prayers, pouring the rest over 'Ali(a.s.). The Holy Prophet(pbuh&hf) then prayed, `O Allah, bless them! Shower your blessings over them, and bless for them their two young lions (that is, their two sons Hasan(a.s.) and Husayn(a.s.))."' ath-Thaqafi also related on the authority of Shurahil ibn Abi Sa'd, who said: "On the morning after Fatimah's wedding, the Holy Prophet(pbuh&hf) brought a skinful of milk, and said to Fatimah(a.s.), 'Drink! May your father be a ransom for you.' He likewise said to `Ali(a.s.), 'Drink! May your cousin be a ransom for you.' "
One day the Holy Lady Fatimah Al-Zahra(s.a.) was shown by her Father, The Holy Prophet(pbuh&hf), a very special kind of Prayer. That he himself was shown earlier by The Trusted Archangel Jibrael(a.s.).This special After-Prayer is to be said after each time, any Prayer of Worship is concluded.The Holy Lady(s.a.) in turn began to teach the short Prayer to so many others. That in the very short time, it became to be known as the 'Prayer of Fatimah Al-Zahra(s.a.). The Prayer Take any kind of Prayer Bead string, such as shown on the image below. The Prayer String should have a total of 99 beads, with two dividers and ahead called the Sheikh.The Prayer Bead is taken by the left hand and with the index finger and tumb of the right hand draws each bead seperately one by one and saying the words as described below. For first set of 33 beads plus counting the first divider. Hence totalling in all 34 beads. For each bead passed say the clearly the words to yourself: ALLAHO AKBAR For each of the 34 beads seperately. For the next second set of 33 beads. For each bead passed say the clearly the words to yourself: AL-HAMDU LE ALLAH For each of the 33 beads seperately. For the third set of 33 beads For each bead passed say the clearly the words to yourself: SUBHANA LE ALLAH For each of the 33 beads seperately.Totalling 100 beadsThat concludes the Prayer of the Holy Infallible Lady of all women, in all of the worlds and in all of the Seven Heavens, The Lady Fatimah Al-Zahra(s.a.)Most or if not all of the Mujtahideen express a great Mustahab (preferable) as near to as Wajib (compulsory) to say this Prayer after any Prayer of Worship is concluded. Many Muslims carry with them at all times the Prayer Bead String so that they can recite this prayer numerously at any time of the day and night. Especially at times when one has nothing to do such as waiting or sitting around lazily.So think about it! What better way of filling your spare and idle time than to quietly recite this small Prayer to yourself in the remembrance and in thankfulness of Allah your Creator and Master. And in return Allah will reward His untold Thawaab and A'jar(reward)!Thus it is good to always recite, in One's idle times. For it keeps the mind away from straying into troubled terrain. But to keep it travelling on the true and right track of good and steer away from evil with its untold mischievous wicked thoughts and ideas etc. He invited the servant to thankfulness for the sake of the consecutive and continuous enhanecment of blessings. And opened the door of euloqy and Praise (of Allah) upon them so that He may make his favours and beneficences great and plentiful for them. 2. I testify that there is no Diety (Lord) except the sole and matchless Allah. And the testification of the singleness of Allah is a word that Allah has declared sincerity (as) it's reality, and made the hearts the centre of it's contact and union. And has made the specifications and research of the oneness of Allah's station obvious and evident in the light of meditation. The Allah Who can not be seen by the eyes and tongues are unable and baffled to describe His virtues and attributes. And the intelligence and apprehension of man is helpless and destitute from the imagination of his howness. 3. Allah made all the beings without previous matter and sample and shape and pattern. And made them wear the dress of life by His main and mights and created them according to His Devine will and Intention short of it that He might have needed their creatlon or have wished any benefit for Himself from their shaping and sketching except this that he wanted to give a proof of HIS wisdom and make the people (creations) aware about His obedience and submission and invited them to his servitude and worship and make His Invitation grand and ostentatious. 5. And I testify that my father Mohammad (pbuh&hf) is the apostle and the servant of Allah. And Allah selected and chose him before appointing him at the post of Prophethood. And He named him before choosing and selecting him. And chose him before envoying and delegating him. Then all the creations were hidden and covered in the covers of unseen and were hidden amid the screen and curtain of fear and fright and stayed near the last and final border of non entity (nothingness) for Allah was aware of and knew the end of matters and because of His encompassing the incidents of times and ages and His knowledge of the predestinates. Allah appointed him (as apostle) so that he may complete and finalise His matter and Implement His order and materialise His decreeds and predestinates. 17. And (Allah set) the subordination and obedience of us (the household of the Prophet (SAW)) for the security of society's system and our Immamate as a safety from segregation and disunity). 23.And Allah made law of retaliation (revenge for homicide) as the security of blood (from being shed). 25. And (Allah rendered) the correct use of weights measure (units) a medium for stopping from selling less (than actual). 30. Certainly, an apostle has come to you from among yourselves; grievous to him is your falling into distress, excessively solicitous respecting you; to the believers (he is) compassionate, merciful. So if you assay and recognise him you will find he is my father not the father of your women and the brother of my cousin, Ali (a.s.) not that of your men. And how nice a relation I have to him. So he propagated his prophetic (mission). He always used to turn his face from the polytheists. And fought against them till he beat them up. He would invite people towards Allah by wisdom, and beautiful admonition. He broke the idols and scattered the aggregation of polytheists in a way that they ran away (from the battle fields), so that finally the hidden secret of oneness of Allah became manifested by him. And he made the logic of religion reach the ears ((of the people) and settled down the foam of the camels of satan and turned the salogan yelling of those devils silent. And downed the agents of hypocrisy and mutual commitments of the infidels got dissolved till such time that, you (people) spoke to a group of enlightened and modest men with the words of oneness of Allah and sincerity. 31. You were on the edge of a fire ditch, and were a cup of drink and the morsel of a greedy one and a firebrand of every hasty one and were being trampled on (by other nations) and drank from the contaminated waters gathered over in ditches and your energy (food) was (secured by) the leaves of trees and desert grass. And for your abjectness and abasement you were always afraid that those around you might abduct you in the winking of an eye. So, Allah liberated you (of these misfortunes) through my father Mohammed (pbuh&hf). Inspite of it that he (pbuh&hf) was involved and at war against the intrepid and the hungry wolves of Arab and the stubborn refractoriness of the people of the books (Jews and Christians). Whenever his opponents would lit the fire of war, Allah extinguished it to your benefit. 37. Oh Allah! bestow upon my parents and all those persons who have rights of their blessings and beneficiences upon me, the best of Your rewards. Oh my Allah, spare me the leisure and respite for the object for which You have created me. And do not let me be busy and involved (absolutely) in my commitments. And do not torment me when I ask forgiveness. And do not deprive me of what I yearn and question you for. 38. Underlying are the rhymes which Hazrat Zahra(s.a.) recited upon the mourning of Prophet's (pbuh&hf) demise. The person who smells the sweet fragrance of the grave of the Holy Prophet (pbuh&hf) so what if he does not smell any other fragnance for long times to come? Agonies and anguishes and grief's poured upon me in such a way that had they poured upon days those would have turned into nights. (bleak, dark and bewildering). 39. The dust of sorrow covered the space of sky and the sun has faded and the bright day turned bleak. The earth has become dark and gloomy after the death of the Prophet (pbuh&hf) Woe! Alas! what the earth will have much of Jolting upon being separated and parted from him (pbuh&hf). It is meritorious and befitting that the east and west of the world may weep upon the parting of Prophet (pbuh&hf) and the persons of Muzzir tribe and all of they rest of the Yemen tribes shed tears. And the great magnificent mountain of the existence and the hidden and covered Kabaah (House of ALLAH) and its pillars should shed tears. Oh the terminator and finaliser of the (series of) prophets! the light of whom is the source of blessing for the worlds inhabitants, Be the salutation and blessings of Allah the desender of Holy Quran upon you. 40. Following you (Prophet (pbuh&hf)) inequities (intrigues and revolts) took shape and variant voices were raised so that if you were present and supervising (things) all these differences and deviations would not have taken place. You set off (on the journey of eternity) from among us and now our condition is like the earth which becomes devoid of the beneficial rains. And your nation upset the order and discipline of matters. So be a witness and do not let their matter get out of your sight. Biography of Lady Fatima (a), the daughter of the Prophet (s), her titles, family life, the birth of her children, verses of the Qur'an revealed in her favour, the event of the cloak, love of the Prophet (s) towards her, her dispute with Abu Bakr after his (s) demise, her knowledge and piety, and her death and its circumstances. Compilation of lectures given by Dr Shariati on the roles and responsibilities of women as according to the life of Fatima Zahra (a). The daughter of the Prophet (s), a role model for men and women. The aim of this book is to create admiration for her uncompromising protest and stance, and sympathy for the injustice she suffered. 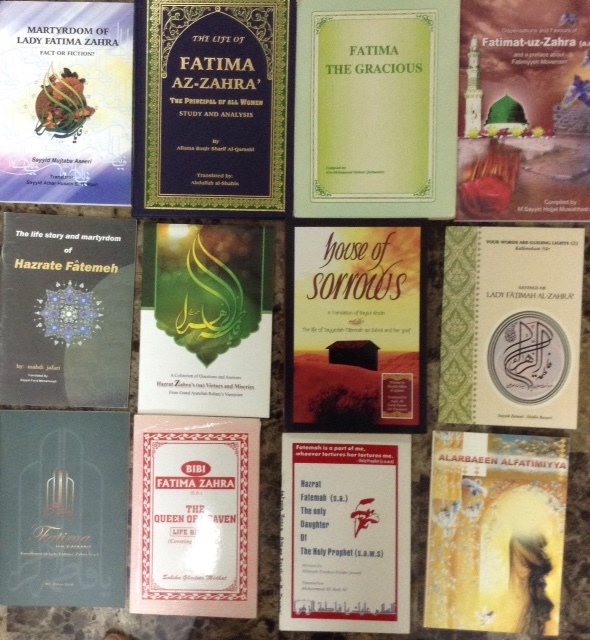 The historical proceedings of the Prophet's (s) daughter Fatima Az Zahra, from childhood until marriage. Then an account of the sufferings and hardships after the martyrdom of the Holy Prophet (s), till the moment of her martyrdom.